The ancients had it easy. To them, the heavens offered guidance for the future and hinted at the will of the gods. The sky told stories of tricksters, heroes, and magical beasts. The sky was an open book, put there to be read and interpreted. It all spun around us, put there just so for our benefit. Comforting, isn't it? In relation to our galaxy, the Milky Way, we are definitely not in the middle of things. Our sun, which is no different than any other ordinary middle-aged star, is located far out on one of the spiral arms of the galaxy, a sort of galactic backwater in a rather hum-drum neighborhood of stars, with nothing particularly exceptional nearby. It all began back with the Big Bang – what Brian Swimme calls the Primordial Flaring Forth, and Connie Barlow calls the Great Radiance. This event is the common thread that connects our planet, sun, and solar system with the rest of what's out there. Ultimately, not only are we kin to every living thing that shares our Earth, we are also kin to nebulae, star clusters, and galaxies. Our brains are not wired to comprehend what's out there in the wide open spaces -- the vastness of it all and our own insignificance. The Earth is an atom in the grain of sand that is our galaxy, on the beach that is the universe. We are a snowflake on Everest, or a raindrop in a thousand oceans. We are very, very small. 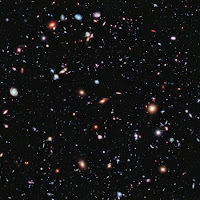 And consider those breathtaking images of galaxies, nebulae, and star clusters from the Hubble space telescope. They are so far away that we don't even see them as they are today. The light from them has taken millions of years to reach us. When we look through our lenses, we look into the distant past, seeing the galaxies as they were when that light began its journey through space. Even light from the nearest star, Alpha Centauri, takes approximately four years to reach us. If it exploded into a supernova tomorrow, we would not know it for four years. We're still here, on the same precious, blue-green gem we've always lived on. We're still spinning around the sun once a year. We may have lost our inflated ego, but we've gained, one hopes, some understanding, perspective, and awe. We can use this newfound understanding about the immensity of it all and the unity of its common origin to recapture some of the wonder that tends to get lost in our technological age. We can reconnect with the wide-eyed awe that is our birthright as conscious beings. We aren't the center of the universe in the way that we thought before, but we are a part of something so much bigger than we are, something far beyond our petty differences and divisions. 1. Sky Watch. Go out on a clear night with no moon, as far away from city lights as possible. Forget star charts, constellation wheels, binoculars, and telescopes. Don't think too much. Just look. Lie down on a blanket on the ground and gaze into the velvet blackness. Imagine entire galaxies with millions of stars, gathered into clusters of their own. Imagine it all expanding, growing, and pushing out into forever. Imagine that you are suspended in space, and the entire sky is below you. Fall into the ocean of the infinite. 2. Hubble's Gifts. 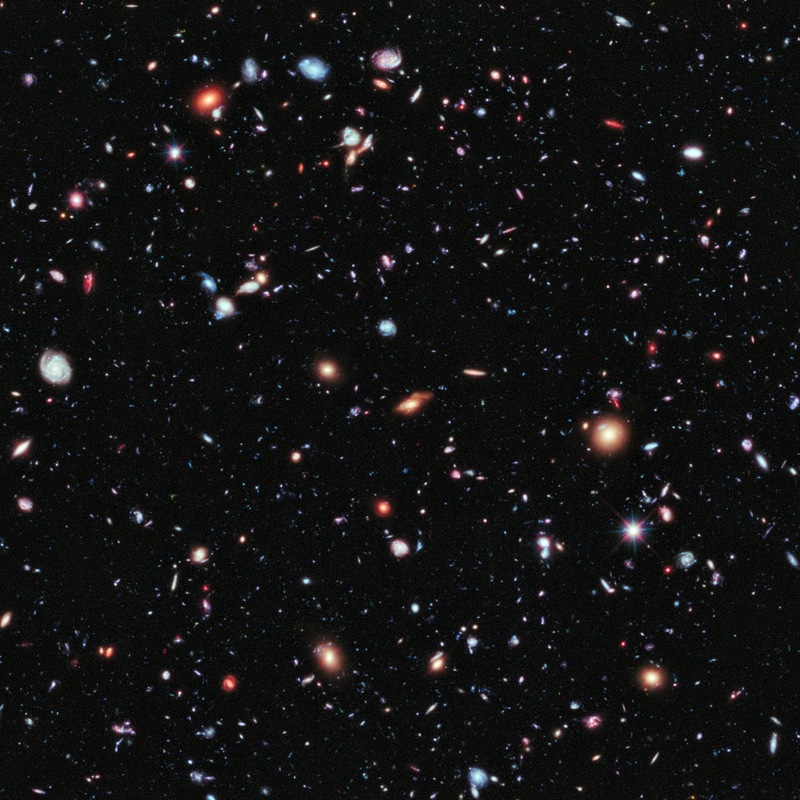 Search out some images taken by the Hubble space telescope. Look at these as you would look at works of art in a museum. Select a couple images as your favorites. Unlike the ancients, who looked for specific messages from the sky, you can create meaning for yourself by relating to the images on your own terms. Write in your journal about the experience. 3. Drop in the Ocean. Fill a small bottle with water and take it to the largest body of water near you: a lake, river, or, ideally, an ocean. Mindfully, imagine one molecule of water within your bottle. Picture it in your mind, glowing blue-green and beautiful. Now add one drop to the lake, river, or ocean. Sit nearby, and meditate for a few minutes on the tiny drop now drifting in the larger body of water, and that beautiful molecule you imagined drifting out with it. Follow its journey in your imagination. Where does it go? Now, mentally make the leap and see the molecule as the Earth, floating in the ocean of the universe. Allow your mind to play with that image for a while. Star Party. This is simply the “Sky Watch” practice described above, on a larger scale. Choose a night when the moon is new or nearly so. Bring blankets, drinks, and snacks. Open up, and share your sense of wonder with others in the group. What are some other metaphors or analogies that could describe our place or size in the universe? How do you feel when you consider the vastness of the heavens? What emotions does the experience of staring at the night sky evoke in you? So, what is the meaning of it all? Is there a meaning to existence? Do we create meaning for ourselves, or are there greater forces at work? Does it matter?